00z GFS run today is already way off on what's happening now. Then the storm starts stopping"
come from the south-east with higher humidity over Adelaide. yes i am talking about tomorrow too. most importantly 3) they're as dry as a lime burners boot. I didn't even mention 900 hPa, it doesn't matter...enjoy the event for whatever it is . I'm looking forward to a drop of rain and milder temps. simply can't get a grip on reality, a bit like me. to get here by midnight, but that stuff forming east of pt. augusta might get to us by then. Yeah poor GFS ain't what it used to be, EC been a far more accurate model. But that's for another day in another thread. looks like the current showers will go south of the adelaide area. yer your not kidding Je, some good stuff back then. Crabs are off the beach at Sema4, very puffy out there! So windy! Just got a huge gusty blast. The crabs are literally up on the beach at semaphore Turnip? Or is that just a saying? 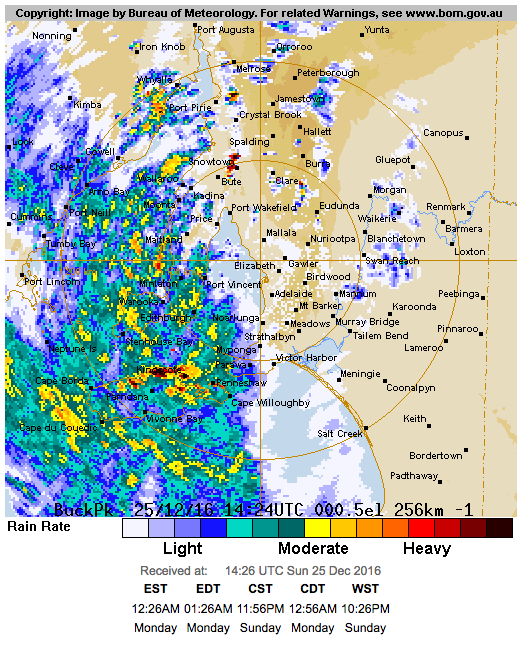 Wrong time of year for the crabs = march/april, just a saying.. Reckon it's going to pour too..
attack of the killer rainband. Been hot here in gulfview heights today. 40.1°C at 3:47 PM. At 10:00 PM still 31.9°C. Looks like in the northern suburbs, we will only get the edge of that rain that's coming. Nullarbor 27.2mm so far since 25 Dec 9am total .. they've had a fair bit this last 72hrs or so..
able to see the cloud structure, looked nuts just after sundown. Thought I'd finally add something to this thread....models have been all over the shop but gradually coming to some sort of agreement apart from GFS. Certainly nothing like the event that it could have been but still a decent event. Essentially dribs and drabs for now down here with a lot of dry air below the moist mids and uppers, more solid rain further west coming down with the deep tropical low, very deep moisture there, cloud tops regularly exceeding 55,000ft on that low with PWATS over 65mm. 220mm at Kintore in SW NT so far since 9am yest and still coming down, and would be expecting similar but at least 100-150mm falls into NW SA, gradually thinning as the low moves SE and accelerates towards the westerly belt and weakens completely. So not a lot here till the low approaches, 3-8mm prob before it does over today and first part of tomorrow before a general moderate to heavier band of rain where we should see 20-30mm, potentially 40mm fairly quickly with the core of that deep moisture in the low moving almost right over us. GFS has it going through no mans land and beyond which is a bit rich. I should add that the West Coast and EP will prob see the best of the tropical low rain, and should see falls in order of 40-75mm. Then we are left with a break with a very moist PBL. ACCESS-R progging dp's in order of 24-26C ahead of strethening sfc cold front with upper low behind with very deep 977hPa sfc low. Should see a band of showers and thunderstorms develop on this front and move ESE through wed afternoon...where they develop is the hard question for now...GFS has it basically ranges and east but I feel EP is the best area for things to start, increasing over YP and gulf areas into Adelaide. Much better CAPE further east but I feel a little sfc heating wed morning if we can get some clearance will see some very good MLCAPE...especially with the real guts of the warm tropical air aloft being moved away so uppers will cool nicely in response to large upper low west. Wed is our best chance of a good thunderstorm....anything that gets up could have potential like Jan 22nd this year, perhaps not quite that volatility but not far off it. See how things go over next 24hrs. Gardens will be getting a fair drink later tuesday. and like you just said and i said before the lower layers are dry as, even with deep green near yellow going over me still no rain showing on the concrete. lotsa big stuff going past to the sw.
east as well as the line of convergence is moving northward. Models this morning have upped the totals again to 40-80mm for the Central areas moving the heaviest rain over us, not in the west of the state. If superior forecasting models can't work it out then it's just a guess from anyone else, lucky dip.